Sunday January 17th 2010. Anyone remember that day? Yes, it was the new Team Sky’s first major race in Australia, yes they won, but as has become customary for Team Sky, they tried some new things. Britain Team in the World Championships. They dominated the closing laps of the race like no National Team had ever done before, despite the fact that they had made no secret of their ambitions. And they were all wearing skinsuits. Fast forward to 2015, and it seems pretty much half the field is racing in all-in-ones. So what’s changed? Historic / conventional wisdom used to dictate that in road racing, aerodynamics were of negligible consequence if you rode ‘in the wheels’ properly. That’s all very well, but not everyone rides in the wheels until the last 250m. A memorable 3 man 150km breakaway in the 2014 Tour of Britain with Matthias Brandle, Alex Dowsett and Tom Stewart saw Brandle take the stage and Dowsett grab the GC jersey. It also had Chris Boardman and Ned Boulting chattering rather excitedly about ‘free speed’ in the ITV studio. Yes, you’ve guessed it. Plenty of skinsuit action in the front of the race. The fundamental benefit of course, is the smooth airflow over the rider’s body. Countless articles have been published by performance specialists extolling its virtues. It’s pretty obvious really. Once you get over the external appearance reservations, a skinsuit is actually also more comfortable. Many of us will have self-consciously tugged at the back of our jersey during a race, making sure it’s stretched smoothly over our lower back. That’s just one example of what a skinsuit achieves without any additional fiddling or distraction. It is functioning simply as a second skin. How should we approach women’s custom cycle clothing? As the rate of growth in mens Road Cycling slows, there appears to be growing interest in the rapidly emerging women’s ‘sector’. 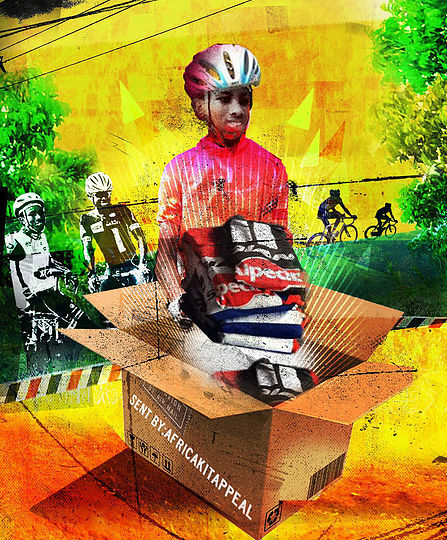 We use the inverted commas because, for us, cycling has always included women. 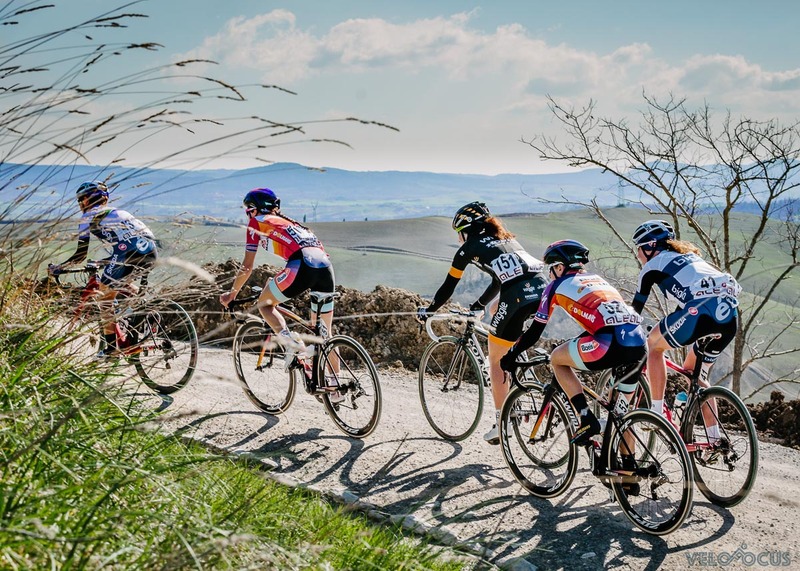 women’s Strade Binache in Tuscany, Italy -are they on women’s bikes? Now, let’s be clear – we know that women generally need a specific jersey due to the obvious physical differences in the torso. Non-racing women have also tended to express more concern about tanning lines than men in our experience. We offer slightly shorter shorts with special laser cut suspenders and a vest-style top for these reasons, but beyond these ‘leisure’ preferences, things may not be quite so clear cut (excuse the pun). What may be categorised as women’s custom cycle clothing may not be the most suitable option. In Italy, which must surely qualify as a more mature cycling nation, womens’ racing has its own slot on the weekly Radiocorsa weekly magazine programme. Watching this offers an interesting insight into the racing world. What’s noticeable is that almost all the teams seem to be riding standard ‘mens’ bikes. We say ‘mens’ but they are not sold as man specific; it just so happens that the majority of users are men and so men tend to be the ones featured in the brochures and ads. In pro racing, there obviously is no such thing as standard. All bikes have been customised for individual physiques. However, what is relevant here is that in a large number of cases, the style of riding is of far more significance than the gender. Sure, an ‘average’ woman, may be different to an ‘average’ man, but there is a massive amount of overlap within the two. So, a womens racing bibshort is generally closer in construction to a mens racing bibshort than a womens recreational short. Working with our women’s team, Bonito Squadra Corse in 2015, we initially offered a women-specific short. Feedback revealed that these were felt to be too short for racing and after alternatives were tested, we settled on the 05118 bibshort which, like all our bibshorts, is available with either man or woman pad. Main reason? Women carry a touch more fat on their thighs than men and the integrated silicone grip on the raw lycra edging avoids the pinch associated with conventional elastic leaving a smoother profile. Although this was a ‘mens’ short, we swapped the pad for a womens version and season-long feedback has been excellent. This is just one example of why the new ‘enlightened’ world of making a womans version of everything may not necessarily be the best option. What we can say with absolute confidence is that we pretty much have a product to suit every kind of female rider. The best way to start is contact us and tell us all about your group and their riding so that we can make some suitable recommendations and provide samples. We all know the clichés of the Italian bella figura and their obsession with style – but this is not just as a result of their preoccupation with appearances. Underneath the elegant exterior lies a rich and diverse history, linking craftsmanship of the highest quality to that more aesthetic side of the clothing industry. The fashion house of Prada in Milan, for example, only became seriously interested in design in the 1970s. From the beginning, it was established as a leathergoods store of high repute on account of the quality and longevity of its products; the same could be said of Gucci from Florence. and many other ‘designer’ labels.